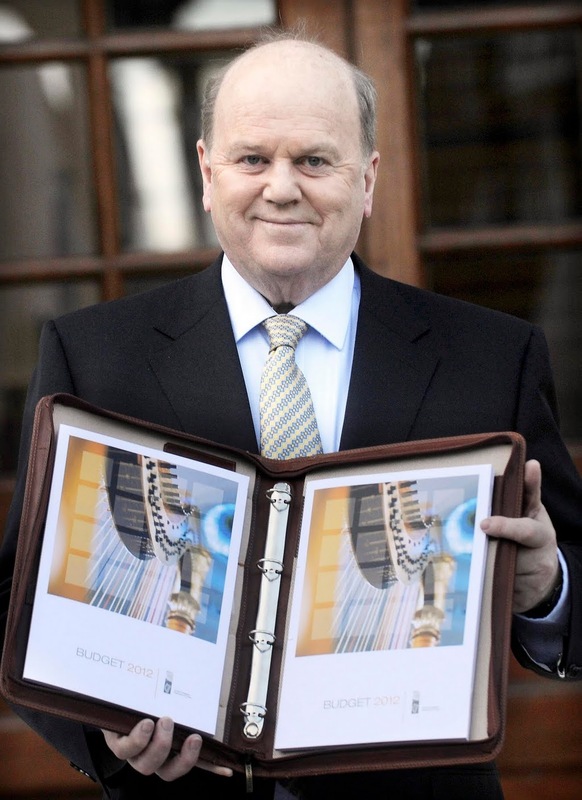 Finance Minister Michael Noonan with a copy of the budget on Tuesday. There is a mixture of resignation, fear and anger in the air here this week after our two-day budget. So much had been leaked in advance there were no real surprises. But even so, the difference between talking about cutbacks in state spending and actually implementing them is a major shock to people. And of course it will be weeks before the cuts start to bite, which is when the real pain will be felt and public reaction will harden. A couple of points need to be made before we start looking in detail at the cuts in state spending and the hikes in tax that have been announced. First off, the budget on Monday and Tuesday was really just a sideshow to the main event which will happen in Europe this Friday as leaders gather for the final summit to save the euro and the EU. It's going to be a week of intense negotiations, and the seriousness of the situation is underlined by the presence of U.S. Treasury Secretary Timothy Geithner, who is on a four-capital shuttle around Europe to emphasize that the stakes are enormous. Europe has to get its house to stop the collapse of the euro. Failure is not an option, since it could trigger a catastrophic global recession, which is why the U.S. is so interested. What's likely to happen is that EU leaders, particularly Germany and France, will insist that all EU countries accept that in future there will be much tighter central fiscal control in Europe. What this means is that irresponsible countries like Ireland, Greece, Portugal, Spain and Italy will no longer have the freedom to borrow and spend their way into a crisis. They will have to accept a new discipline that in effect will mean they lose the right to make big decisions about their own economic affairs. German Chancellor Angela Merkel wants European Treaty reform which will introduce tough rules to keep national budgets under control and make progress towards a fiscal union between the eurozone states. She wants a system which would bring countries which exceed the agreed limit for deficits of 3% of national income and the agreed limit for government debt of 60% of GDP before the European Court of Justice. Presumably if countries were found guilty, the ultimate sanction would be expulsion from the eurozone and the EU. The German government does not think this can be achieved overnight. Merkel has said that she sees it as a process which will take several years. But the object for Germany is much closer fiscal control of individual countries by the centre. In return for agreement to this kind of central fiscal supervision, Germany will continue to prop up the system and the weaker countries in particular. It may even agree to Eurobonds, or something similar, which would spread the risk of lending to weak EU countries like Ireland across Europe. But the German taxpayer is not going to agree to this unless discipline and control are imposed. The first thing to be said about this is that Ireland is already there to a large degree. The IMF/EU supervision that came with our bailout means that we have already lost our economic sovereignty. We have to get approval for our budgets in advance to allow the IMF/EU to see that we are sticking to reducing deficit targets. So this would not be a huge leap for us. Our present situation is supposed to be temporary, until we can borrow from the markets again. But don't hold your breath. There is a widely held view here that Irish people would reject by a vast majority any treaty proposal to take fiscal power away from our politicians and give it to the EU But given the way our own politicians have bankrupted the country, I'm not so sure. Would we have had the disastrous property bubble if the EU was keeping an eye on us? Definitely not. If a proposal to cede control of overall fiscal limits to the EU but retain control of fiscal details is explained to people here, I'm not sure that everyone would vote against a treaty change of that kind. Particularly if that is the price of continued support from the EU as we struggle to get our finances on to a sustainable level again. The truth is we really don't have an option, and people here would realize that. From a European perspective - -and particularly from a German perspective -- our ability to manage our own economic affairs has been proven to be inadequate, even disastrous. And this latest budget does little to inspire confidence. It is yet another example of the inability of Irish politicians to bring real reform to our system and to inject real incentive to get our economy moving again. It is a further example of how deeply ingrained the dependency culture is here. And of how unwilling we are to face up to reality and pay our way. We have a huge annual budget deficit to bridge here over the coming years, but the progress in this budget was minimal, despite the outcry over the cutbacks and tax hikes. Before the budget was framed the government parties had already agreed that there would be no cuts in basic welfare rates. And they are committed already under the ludicrous Croke Park agreement that there will be no further cuts in basic pay for state workers. Which would be fine if we were not in crisis. It would be fine if unemployment benefit here at €188 (plus €124 for an adult dependent and €30 for each child) was not almost twice as high as the rate in the U.K., including Northern Ireland.) I'm not saying it's easy to live on this, but we are way out of line. And it would be fine if teachers here, for example, were not being paid an average of 20 percent more than their counterparts in the U.K., with many other state workers enjoying pay levels that are similarly out of synch with other countries. And it would be fine if the guaranteed pensions that state workers get were not being paid out of borrowing by the state, at a time when many private sector workers have seen their pension funds collapse in the markets and can't do anything about it. There has been some effort in this budget to introduce a new approach, but it's tinkering rather than fundamental change. And it's all accompanied by apologies rather than a clear statement that our present system of high spending and falling tax revenue can only continue in cloud cuckoo land. The budget speech did point out that tax revenues fell from €47 billion in 2007 to €31 billion in 2010, a fall of one-third in just three years. Did state spending fall in line over the same period? Are you kidding? No, we carried on much as before until at last the markets wouldn't loan us any more and we had to go cap in hand to the IMF and the EU. Since then we have avoided turning Ireland into Greece by cutting state spending very slowly so that we can avoid riots on the streets. This year's Budget will see €2.2 billion in cutbacks in state spending in 2012 (€1.4 billion in current spending and the rest in cancelled capital spending) as well as €1.6 billion in increased taxation. It's a start and it will meet the deficit reduction target of 8.6% for the year. But it still leaves a very long way to go to reach the 3% deficit target by 2015. Cutbacks penciled in for next year and the year after are higher and will be even more difficult to achieve without making fundamental changes rather just tinkering with a flawed structure. An example would be the children's allowance system here which is a universal payment made to all families regardless of income. The monthly payments are huge by international standards, with €140 each for the first two children, €167 for the third and €177 for the fourth and subsequent children up to now. The budget has standardized the payments at €140 each for all children. This has all the Catholic mothers up in arms, none of whom appear to have seen the movie Cheaper By the Dozen. It has been characterized as an attack not only on our traditional values but on poorer families. Which begs the question why parents who can't afford it go on having more kids. But you can't ask a question like that in Holy Catholic Ireland. A family with four children currently receives €624 each month and this will fall to €560 a month by 2013. It's not the end of the family here, which is what you would think listening to some of the reaction. That's what years of boom time mollycoddling by the state can do. It has made people here believe that providing for children is the state's job rather than the responsibility of parents. The system should be means tested and limited to families living in real poverty, but so far the government has not been able to organize this, even though the present system costs around €2.5 billion a year and more than half the families with children don't really need the payments. There are many other minor changes in spending in this budget. For example, university fees go up by €250, but they are still one-third the level they will be in the U.K. next year. There will be a household charge of €100 a year, the first step towards a new system of property tax to come in the future, but then every country in Europe except us has a property tax. Fuel allowance payments to people on welfare will be available now for six months of the year instead of eight months, which may not be too difficult given the mild climate we live in. And there is much more ... but almost all of it is minor adjustments to a very bloated system of welfare payments. The system inflated during the boom as our politicians bought votes and in the process created a culture of entitlement and dependency which now makes facing reality much harder. We’ve got a long way to go. It's the same story with taxation. As predicted, the budget did not increase basic income tax rates but the higher rate of sales tax went up by 2% on so-called luxury items like TVs. lower rate of sales tax. The overall effect of this budget will be felt mostly by middle class families who will find the cuts and sales tax changes will cost them around €500 to €800 a year. It's not the best, particularly when things like oil and gas are soaring in price. But it's the softest possible shift in our finances given the huge budget deficit we still have to close.